Woodside Returns to Winning Ways at Springfling Targa. 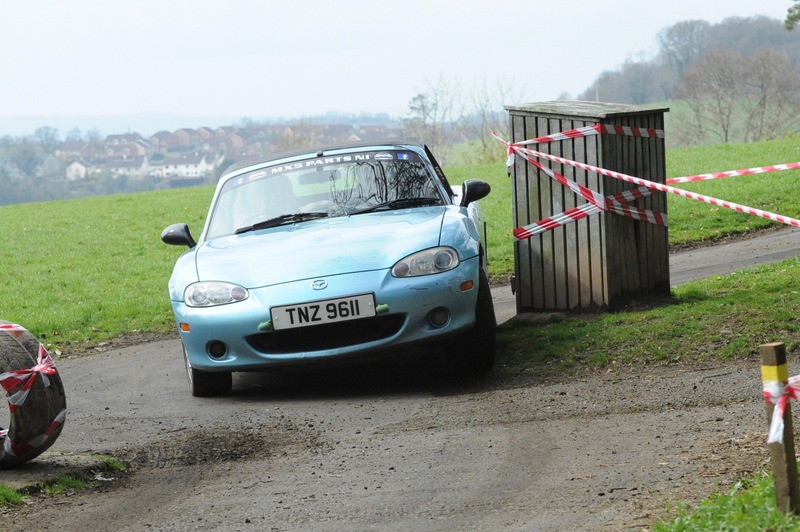 Despite their massive popularity, only one Mazda MX- 5 made it into the top five on Dungannon Motor Club’s annual Springfling Targa Rally, sponsored by Donnelly Group. Now widely regarded as one of the best events of this type, the 2018 entry list filled up in little over an hour, leaving many disappointed. 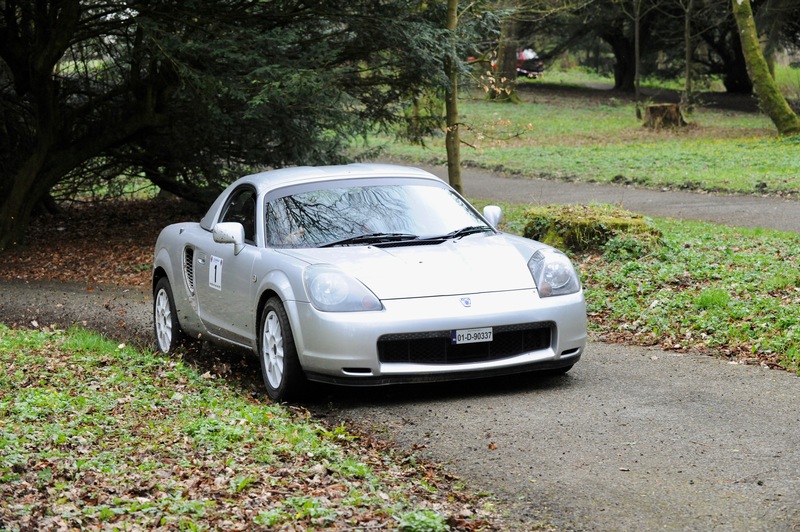 It was a Toyota MR2 though that topped the results, with 2016 winners Robert Woodside Jr and Bruce Drummond stopping Christopher Evans from making it two in a row at the Dungannon event. After weeks of damp and cold conditions, the weather was kind. A shower of rain wouldn’t have dampened the enthusiasm of competitors as they worked their way around three loops of tests, all of them conducted on private properties. 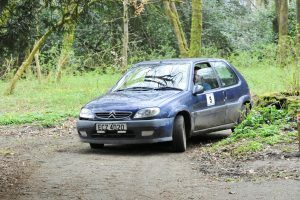 The Rally Headquarters was the Cohannon Inn at Tamnamore, and at exactly one minute past ten, Christopher Evans pulled away from the start to tackle the first loop of six tests. Dungannon Motor Club had included two new test locations this year, and thanks to the approval of the Mid Ulster District Council, the challenging Windmill Wood returned to the schedule following some resurfacing work last year. A renewed focus on safety also demanded more marshals, and close to seventy personnel were required to be in position for the duration of the event. 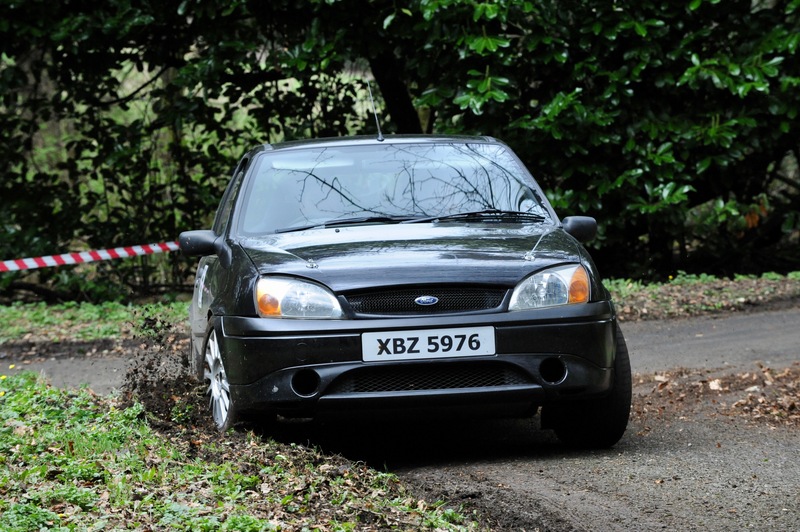 A special observer had been appointed by the Association of Northern Ireland Car Clubs, and he visited each test to check the standards to which the event was being run. Loop one completed and the crews were back at the Tamnamore Control, with Robert Woodside Jnr in first place. He had opened out a tiny 0.1 of a second lead over just six tests, and the smile on his face showed that he was really enjoying it. In second spot was Front-Wheel-Drive Semi-Expert, Damien Mooney, followed one second later by David Crothers partnered by Barbara Kane in a Mazda MX-5. They too were just one second ahead of last year’s winner Christopher Evans in his Toyota MR2 with Kevin Fagan in the navigator’s seat. 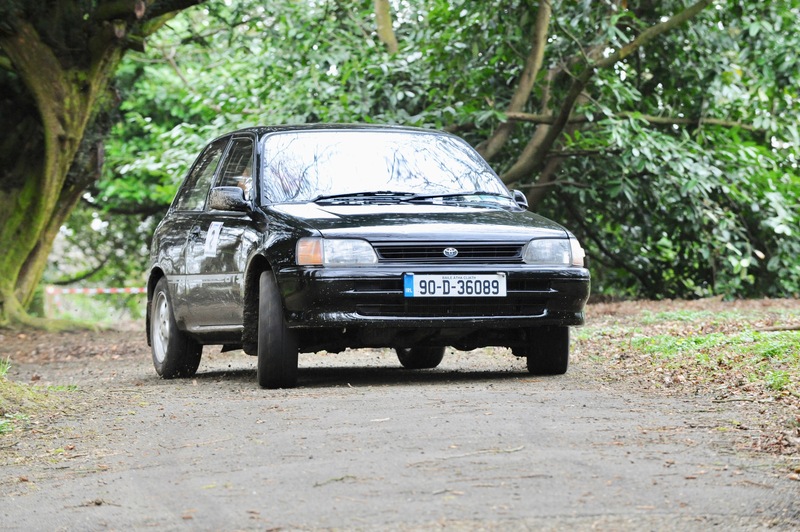 There was a tie for fifth place between the Toyota’s of John O’Reilly in his MR2 and Eamon Byrne in his Starlet. 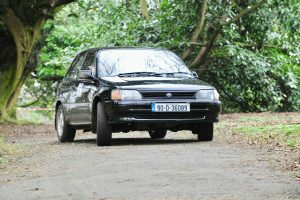 The Novice leaders in Front-Wheel-Drive were Dungannon brothers Darrell and Jordan Burns, running at number sixty one, and driving a Ford Fiesta, while Leslie McLean and Stephen McCombe in their Mazda MX-5, were leaders in the largest class on the event, the Novice Rear-Wheel-Drive class. There had been four retirements recorded after the first loop. Desertmartin Large Saloon Autotest Champion Mark King had swapped his Vauxhall Nova autotest car for his Mazda MX-5 and was partnered by fellow autotester and DMC member Gary Campbell. 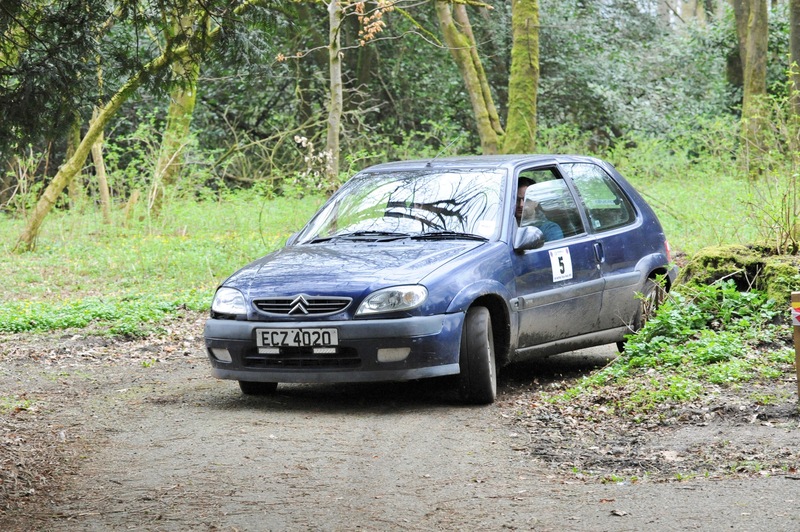 They had got off to a flying start, setting the fastest time on test one and lying third overall after three tests. However, it wasn’t to be this crew’s day when the clutch gave up on test four on the first loop leaving them out of the running. Loop two was identical to loop one and upon return to the Cohannon Control for lunch, Robert Woodside Jnr was still in command of the event overall. Christopher Evans was now third behind Damien Mooney, having moved ahead of David Crothers. In the other classes, positions remained as they were. The final loop of six tests brought the day’s rallying to a close back at the Cohannon Inn. 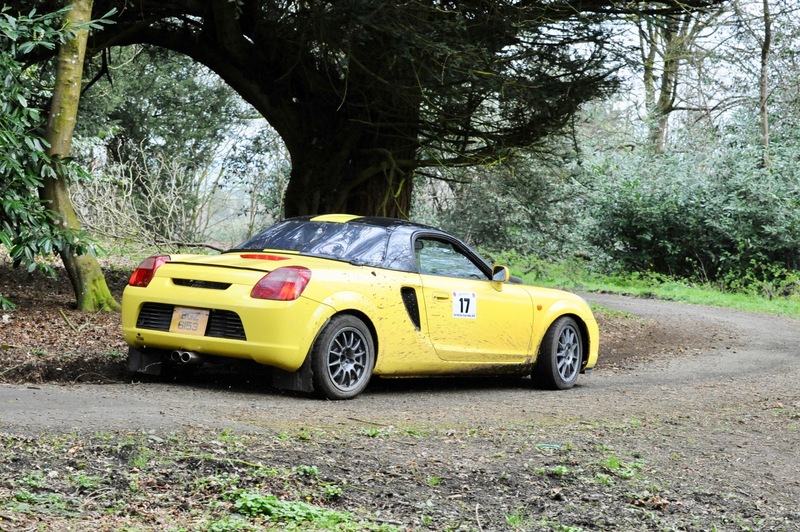 Toyota MR2 was the car to beat this year with the top three crews all steering theirs home with ease. Robert Woodside Jnr and Bruce Drummond finished in top spot, followed by Christopher Evans and Kevin Fagan only fifty seconds ahead of John O’Reilly and Nick Sparks, who finished in third overall. Eamonn Byrne managed to hold off Mark Francis to secure fourth place overall. By now, there had been two more unfortunate retirements, Andrew Earney in his Toyota Yaris had a mishap with a tree in Windmill Wood ending his day, and Eric McIvor and Neil Warnock were forced to retire their MX5 due to a mix up with keys at the lunch halt, which left them unable to complete the final loop. execution of a safe day’s motorsport, enjoyed by all. Malcolm McQueen, Clerk of the Course and Geoffrey presented the beautiful Galway Crystal awards to the class winners, and thanked everyone for all their help in running such a professional event. Roll on 2019.